Microsoft has announced that its Forza Racing World Championship 2018 will take place at the Gfinity Esports Arena in London, England from October 20th–21st. The finals will take place after the ForzaRC Series 2 Playoffs in Mexico City later this month, where the top 36 drivers of the 2018 Forza Racing Championship season will compete for $75,000 in cash prizes. Following this showdown, the top 24 drivers will move on to the Forza Racing World Championship, which promises to the biggest, best and most competitive ForzaRC event yet. 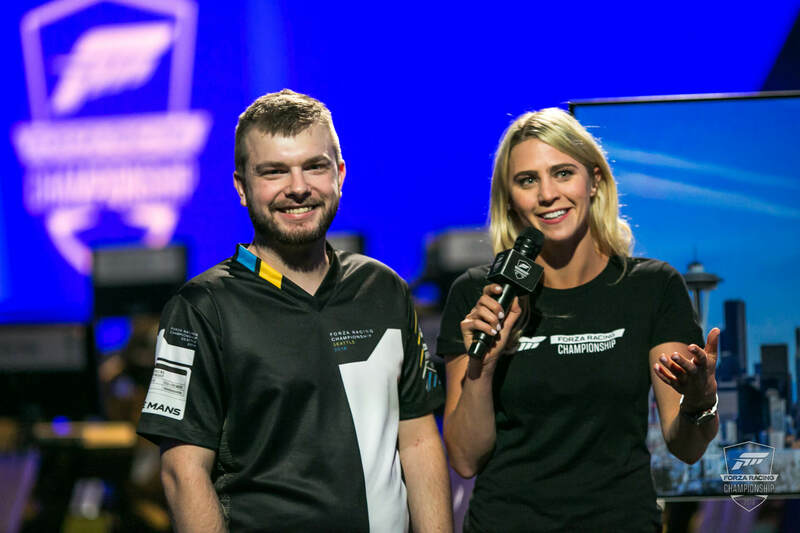 ForzaRC Series 1 Playoffs Champion Robin ‘bbbb0x’ Betka with ForzaRC Presenter Katie Osborne. Drivers who qualify for the Forza Racing World Championship finals will race for their chance at a share of the prize pool featuring more than $100,000 in cash prizes and the title of 2018 Forza Racing World Champion. Viewers can tune in to the action and watch it unfold on the official Mixer channel of the ForzaRC esports series. Not only can you earn rewards, but you can also shape the tournament itself by voting on different race features. Microsoft has also introduced a new ForzaRC extension over on Twitch, where viewers can receive unique in-game rewards via Twitch Drops. For those who want to experience the Forza Racing World Championship in-person and see the action unfold over the weekend at the Gfinity Esports Arena in London, you’ll be able to secure tickets for £15 starting later today at 11am Pacific (2pm Eastern, 7pm BST). This is the first time in history a ForzaRC event will be open to members of the public, and you can find more information about the onsite event and purchase tickets over on the official ForzaRC Eventbrite website. Microsoft says that following its ForzaRC Series 2 Playoffs later this month, the final car and track combinations for the world finals with the full line-up of competing drivers will be revealed. In addition, a special livestream ahead of the Forza Racing World Championship on October 10th at 12pm Pacific (3pm Eastern, 8pm BST) will detail viewership rewards and offer a rundown of the tournament structure with special guests and more. For the past two months, drivers around the world have been competing on Forza Motorsport 7 for their chance at securing a spot at the ForzaRC Series 2 Playoffs in Mexico City from September 29th-30th, and of course, the Forza Racing World Championship finals. After a long, hard and well-fought season, it’ll all concludes in London, England this October. For more on the ForzaRC, be sure to check out our detailed recap of the Series 1 Playoffs from Seattle, WA last June, as well as our exclusive player profile of the event’s champion, Robin ‘bbbb0x’ Betka, and our experience of attending the ForzaRC Pre-Season Invitational from earlier this year.